Summary: Thirteen year-old Phano has had a complicated life. With a step-mother who is a Courtesan and a father who has mismanaged the money of relatives and friends, it seems her hopes of marrying well are slim. When Phano and her step-mother finally escape the clutches of Phrynion who claims to own them both, a journey begins that will see Phano in love with a man who is shortly to become the most powerful man in Greece. But will her claims to Athenian citizenship hold up under scruntiny Phrynion keeps raising? In a city facing likely invasion, the favour of the gods is not something to mess around with by having a slave married to a king. Review: Author Priscilla Galloway takes the scant details of a court case facing an Athenian jury before 340 B.C.E. and fleshes out an informative and entertaining story surrounding Phano, the Courtesan’s daughter. (A courtesan, by the way, is a woman who sleeps with wealthy clientele.) Despite what some assume to be a lowly birth by Athenian standards, Phano is actually the daughter of two Athenian citizens, making her a citizen herself. But enemies of her family are willing to use gossip to cast doubt, and Phano finds herself having to explain and defend her heritage on several occasions. 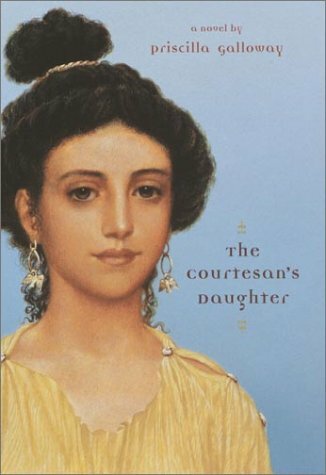 I love the historical aspect of The Courtesan’s Daughter as it transported me to Ancient Greece, a country struggling to hold on to democracy and protect themselves from impending war. So much of their fate is tied to status and the gods, and Galloway brings this to life through her vibrant writing with heartfelt characters. My favourite character was Newby, the goose, because Galloway’s descriptions of her love and devotion to Phano were simply wonderful. I loved the scene after she has her own brood of goslings where she makes Phano lead them all because Newby sees her as the goslings’ grandmother. With a quick-paced plot, the historical aspect, a bit of romance and intrigue as well as a main character with substance, Galloway’s book is great pick for early female teen readers. The Courtesan’s Daughter by Priscilla Galloway is published by Penguin Canada, (2002).